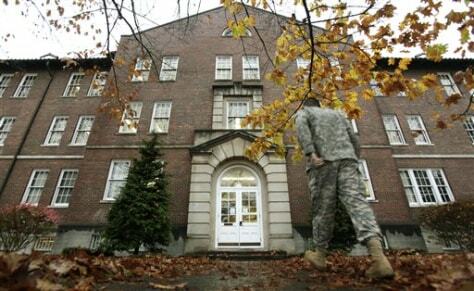 A military court building on Joint Base Lewis-McChord is shown Tuesday, in Washington state. An Article 32 hearing for Staff Sgt. Calvin Gibbs began on charges that include murder, dereliction of duty and trying to impede an investigation, in connection with the deaths of Afghan civilians while Gibbs was deployed in Afghanistan.